Recently dropped back into the real world after holiday, I needed a little pick me up. And not in the tonnes-of-antioxidants-spinach type of way. More in the ... well ... chocolate or bread or cheese kind of way. I know you know what I'm talking about. Batch of cookies - check. Fresh baguette with ample butter - check. This little number is what I came up with. It's kind of a mac and cheese. Only fancy. And a soup. Hence, I had no idea what to call it ... and ended up with 'Comfort Soup'. It could have just as easily been Fancy Mac-n-Cheese Soup. 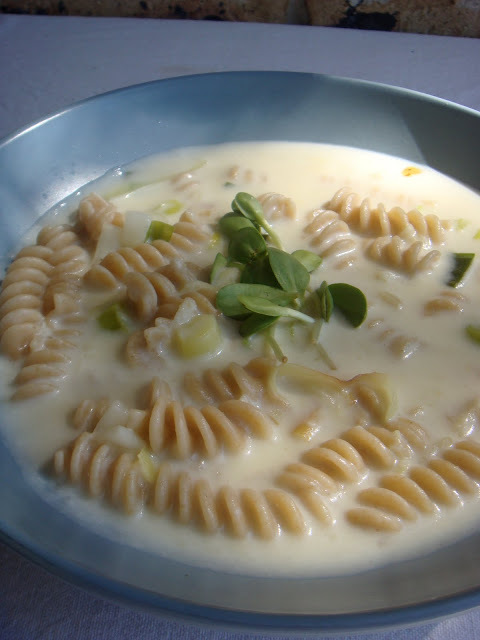 Or Apple, Leek and Cheese Soup with Pasta. A little cumbersome, right? Especially when it's all about those simple things that make one happy. Simple things. Yes. Anyway, this dish was full of cheesy goodness but with the virtuosity of soup. Nelle and I both loved it for lunch one cool, rainy day. And there was a little left over, which morphed into mac and cheese (minus the soup) in the fridge. Feel free to add less milk to the recipe and make mac and cheese straight up, if you prefer. 1. Boil the pasta according to the packet directions - but try to keep it al dente. You can continue with the rest of the recipe while the pasta is cooking. When it's done, drain it and set aside. 2. In a heavy-bottomed pot, saute the leek in olive oil until it's soft. Add the shredded apple and stir. Add the cornstarch and stir until everything is well mixed - do this all over medium heat. 3. Gradually add the 4 c of milk, stirring as you go. Be consistent with stirring, because your sauce (oops, I mean soup base) can easily stick to the bottom of the pan and burn. 4. When the milk has thickened nicely, turn the heat down to low and add the salt and cheese. Stir until the cheese has completely melted in. Remove from heat, add the pasta, and serve up with some fresh bread and a green salad. My soup was completely organic ... the leek was about $1 and the apple about $0.70. The milk was $2.05 and the cheese was $3 all up. The pasta was probably around $1.75. This whole batch of soup cost me around $8.50 - what I would've paid for one bowl of soup out at a cafe. And where else can you get mac and cheese soup? i just picked up a heap of organic jam from aldi for 99c and as i was driving home i thought of your vegan cookie recipe! they were so good.